All too often we hear about rescue dogs pulling out of their collars and fleeing. This is the best way to avoid that happening. These wonderful pups often come to us with no experience of busy areas, different noises, etc. They frighten easily as a result and it is up to us to do all we can to keep them safe when outside of our homes. 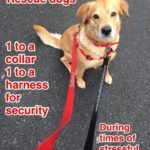 This is an excellent photo of what we are talking about when we refer to “double leashing” a dog that is timid, new to the family, or overall, just plain nervous. Also a very good idea to make sure when you leave your dog with a pet sitter, you leave solid instructions that your dog is to be double leashed.